On Friday I went for a walk along the walls. The best part of the walls, from Bootham Bar to Monk Bar. I make a point of walking along here every spring, because of a particularly magical part of it, the best part of it, being up so close to the tree branches. 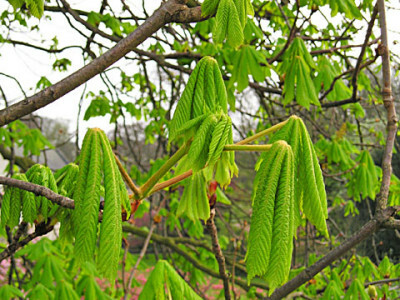 And particularly, in spring, the horse chestnut trees as their leaves unfurl like pencil sharpenings. – wrote A G Dickens, in 1952. This year so far for me has been very difficult, full of sadness. But we all have to count blessings and do our best to keep going, don’t we. Beautiful enduring things can help. I’d noticed that the chestnut tree on Burton Stone Lane was beginning to unfurl, and thought I’d visit my favourite one, on the way into town. On the way, at Monk Bar, I thought I’d say goodbye to Mike Bennett’s Richard III Museum, the doors of which have been closed, while it undergoes refurbishment/transformation. It was I think 30 years ago, when I was sixteen, and living on Gillygate for a short time, that I first walked along this stretch of the walls. I’ve got photos from that time of the converging lines of tight stone walls in that bit just after you leave Bootham Bar. 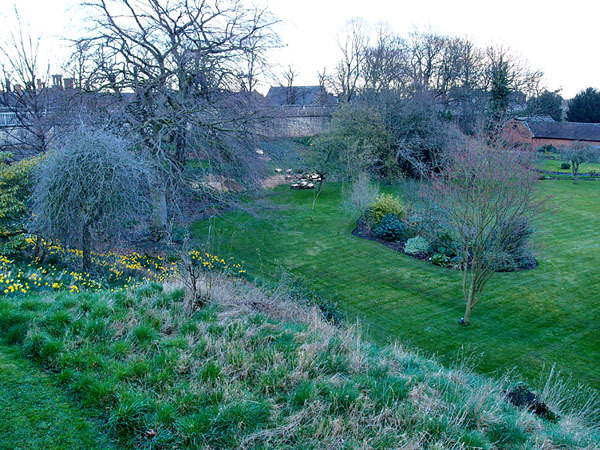 Then it opens out and you get a view of the Deanery gardens and other gardens of the Minster precincts. And it was when it opened out that I looked across and saw a sawn-off stump, where my favourite chestnut tree used to be. I’d been marching along but stopped, stood, couldn’t quite believe. Took this photo, thought that might help. Walked a bit further along the walls, stopped again, nearer, took another photo. Stood there wondering if I’d been completely mistaken. Looked for the chestnut tree a little further along. 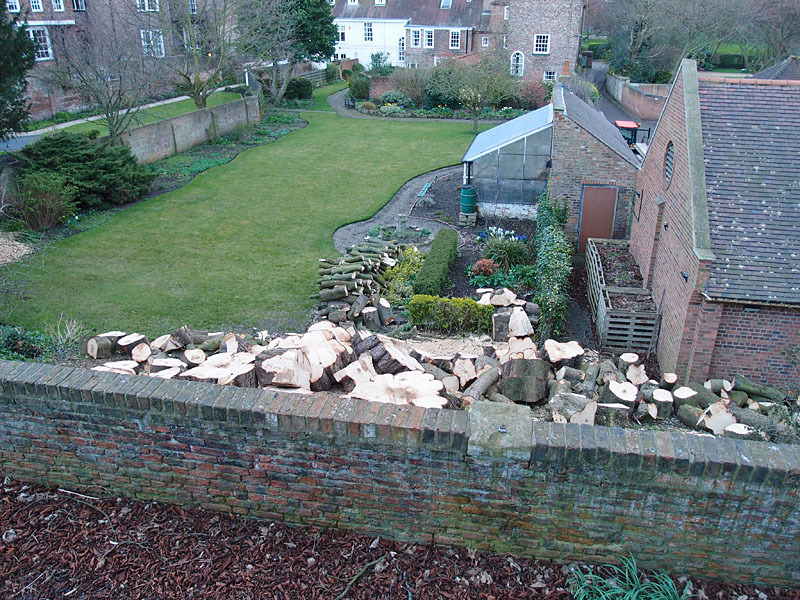 No, they really had killed that chestnut tree. That special, irreplaceable tree. Has gone. You can’t stand on the walls walk and admire the buds opening, really close by your face, like spring’s gift. There’s just a stump, down there somewhere. Now I do know that on the grand scale of things this is totally unimportant. People are suffering, dealing with unbearable trauma, the world is full of misery and injustice and sadness. I know that and that’s why I need to go to look at green things, particularly old wise green things. Trees aren’t ‘wise’, but it can feel like they are, having been there so long, forming their trunks, laying down each ring of growth, while our little lives pass by them. When I saw this wise old beauty had gone I felt like turning round and going back home. Or just sitting there and staring, stopped. Too many beautiful things have gone. So many beautiful things have gone that I’m not sure I like it here anymore. But I carried on walking, and a little further along there was another one, a stump and a cut-up trunk. I stood there again, wondering how this had happened and why I hadn’t heard or seen that this was going to happen, and why no one else had mentioned it. 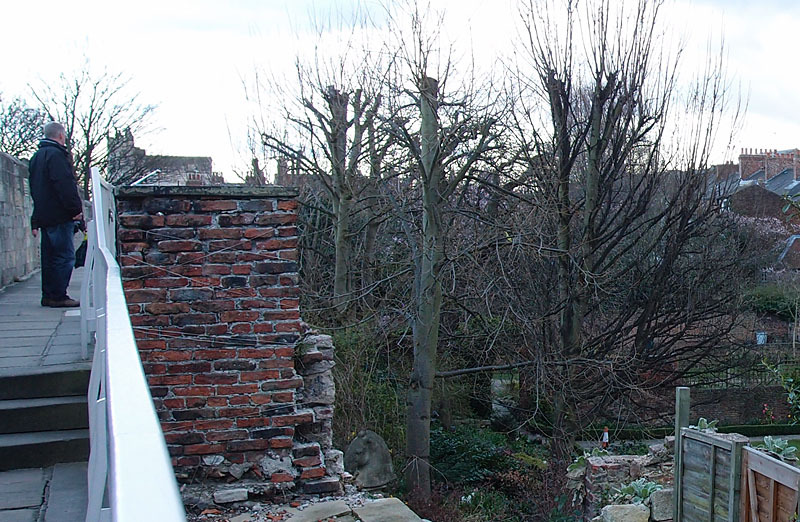 A couple passed me and the man commented to the woman on the sawn sections below, how it was obviously a big old tree they’d removed. An observation, in passing. He won’t miss its canopy up here on the walls walk because he never knew it. A little further along, when they got to the other stump, they wouldn’t know what it was like in the springtime and that you could almost touch its sticky buds as they opened. I passed the pointlessly mutilated trees in the gardens of Gray’s Court, amputated stumps with twigs, shapeless and graceless. I took a few photos of the Minster. Same old same old views, lessened every year as the soul of the city around it shrivels up. I wandered on, disorientated, to Monk Bar. To the closed door of the museum Mike Bennett made. The word museum is apparently banned now. 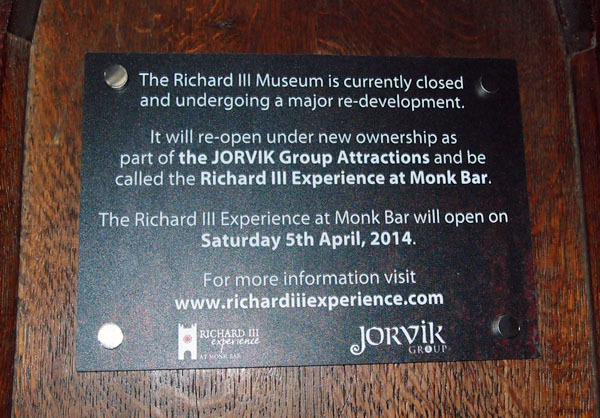 Get ready to welcome the ‘Richard III Experience’. I don’t think I’ll want to walk along there again. Doesn’t matter. The tourists will fill it. They already do. And after all it is all about our visitors now, isn’t it. Absolutely all of it. In the 1990s it was going that way, now it’s complete. People like me just stand and watch, and see so many beautiful things lost. Easier perhaps not to care. There was an application submitted about these tree works. Was it put online at the time? I check fairly often and don’t recall seeing it. Did anyone care anyway? York folks where were you? 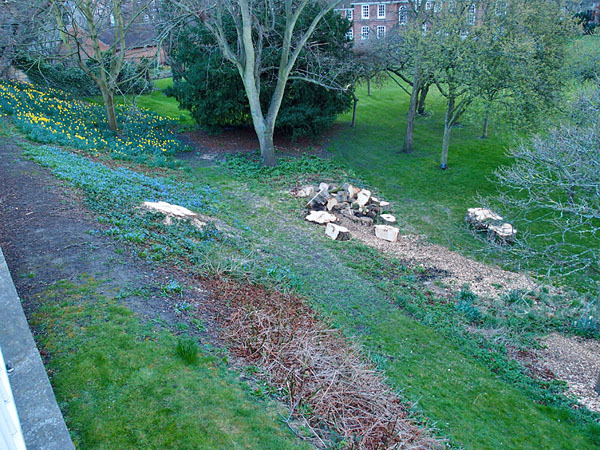 A great big fuss about the not particularly attractive tree in the Museum Gardens, no fuss at all about the loss of these trees. The online application page says there were ‘No objections’. How could that be? Or were there perhaps objections but the planning department hasn’t got around to logging them yet on the online system. Was the application properly advertised in the first place. So many questions. The application form says the trees were showing signs of bleeding canker, so should be removed in case they lost branches, being so close to the public walkway. Branches usually fall downwards, not sideways. And how big a risk was it, exactly? And how can we justify removing so many trees based on this very small risk that they might one day possibly injure a passerby? Whether or not we as individuals valued these particular trees we should be asking questions about the future of the trees in the city centre and beyond. I think this needs another page, maybe several. More later. I still can’t quite believe I saw it right. 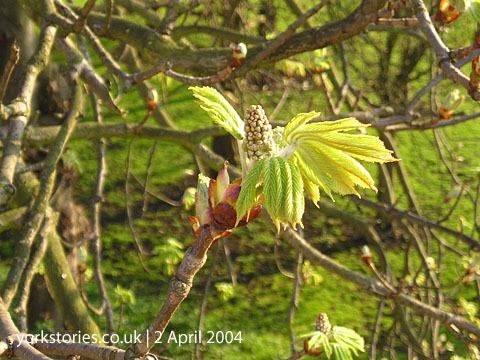 Perhaps someone else can have a walk along there and confirm that the sticky-budded chestnuts really have gone forever. And maybe someone else can explain why. Because if those trees needed removing then I can think of a couple of other chestnut trees looking far more diseased, presumably also doomed. As are most old trees in the city centre, it seems. It is a shame but “Branches fall downwards not sideways” isn’t completely true. Branches catch and twist and fall unpredictably. I know how close the branches were to the walls, I love that bit too, and I’m prepared to believe that a branch falling could end up on the walkway. Best thing they could do is replace them with sweet chestnuts – something edible! Perhaps, but the risk, if there was one, must have been tiny. A very painful/distressing event on many levels. Spring should be more encouraging/uplifting. 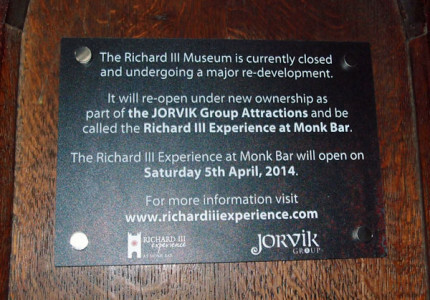 I wouldn’t be so sad about the Richard III museum. The prior owner handed it over to YAT due to ill health, I hear he’s now sadly passed away. However, a lot of the museum’s fabric is being kept, as are the staff. Other than a facelift, not much should change. At least it isn’t another Starbucks! It’s sad about the loss of the trees though, they were beauties. He wasn’t just the previous owner, he was the founder, and the museum had a unique feel to it because of that. Its closed door was particularly sad, to me, because of Mike’s recent death. I’m glad the staff are being kept and I’m sure change and modernisation are inevitable – we have to accept changes of course. Still, I feel, sadness is often an appropriate and honest response to some of the changes we witness.